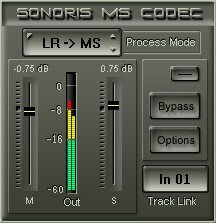 With the Sonoris MS Codec for SAWStudio, you can convert stereo signals to, and from, MS format. The NMSC can be used to simply convert a MS signal to stereo. The NMSC can also be used in mastering, to enhance the stereo image of a mix. It is possible to widen of shrink the stereo image but more advanced techniques are also possible when the M and S signals are processed individually. The NMSC can also be used in mixing as an effect to create more or less distance between sound sources in a signal. This technique can be of use in for example film productions, where you might want to create the illusion of a sound source that moves closer or further away. 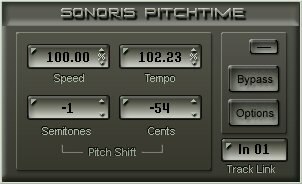 Also, sub mixes can be adjusted in width to the width of the main mix when for example recording an orchestra. Another very useful effect is to use the NMSC after a reverb. You are now able to adjust the stereowidth of the reverb! When you change the balance of the M and S signals before decoding, the width of the stereo image changes. You are actually changing the level of the common information of the L en R channels! So, when for example you want to widen the image, just reduce the gain of the M channel because this reduces the common or mono information. When the S channel gain is reduced, the image shrinks because of the opposite effect. This is just a example of what you can do with this technique, more examples can be found in the helpfile. You can for instance process the M and S channels individually. This is a mastering trick. 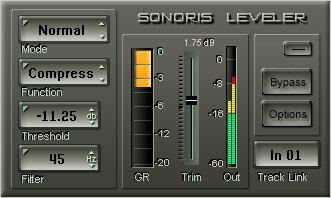 For instance, compress only a voice signal in the middle, or enhance the stereo width of a cymbal by using eq on the S signal only.